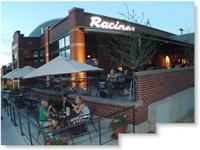 Racines has been Denver's favorite breakfast, lunch, brunch, dinner & late night place since 1983. Located between the Cherry Creek shopping district and downtown Denver, Racines is Denver's favorite meeting place! We’ve been catering bridal showers, wedding receptions and bridal attendant parties since 2006. If you’re looking for a beautiful private party location with delicious food and staff that does it all for you, you’ve come to the right place!